You can make them all at once, or refrigerate some of the filling to make a fresh pie at another time. You can use the recipe for the pastry below, or use your own recipe for pie pastry, or use purchased pastry. A visitor to Rhubarb-Central.com, Carolle G. from Canada, was kind to share this Galette recipe with visitors to this site. Combine the pastry ingredients, adding the water ingredient gradually, until dough comes together, pastry should not be "sticky". Lay a large piece of parchment paper on the counter for each pie to be made. Pat pastry dough into a ball, and using a rolling pin dusted with flour, roll out the pastry into a circle, about 12 inches wide - the edges will be uneven. Add the 3 cups of water to a pan. Combine the lemon juice, sugar, cornstarch, spice and salt together and mix it into the water. Bring the mixture to a boil, and allow to boil for 2 minutes, stirring constantly to avoid sticking and burning. Add the prepared apple and rhubarb pieces and return the mixture to a boil. Reduce heat, cover, and simmer mixture for about 6 - 8 minutes, stirring often as mixture will begin to thicken. Remove mixture from heat, and allow to cool for 30 minutes. Transfer the mixture to the center of the prepared pastry, forming about a 10" circle. Fold the pastry over just to cover the edge of the filling. Lightly brush the crust with the egg white, and sprinkle the pie with raw sugar. Bake at 400° F for 10 minutes, then reduce heat to 375° F and continue to bake for 30 - 40 minutes, or until done. Note - If the pie edges begin to get too dark, make a pie crust shield to prevent them from burning. 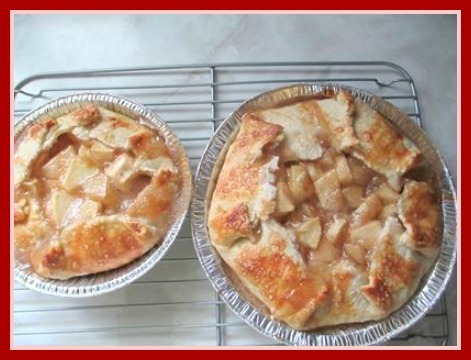 ﻿Thanks Carolle, for sharing your recipe success! Visit www.best-easy-apple-recipes.com for hundreds of free, easy recipes with apples - a website devoted ONLY and ENTIRELY to Apple Recipes that ANYONE can make!